Are you in the mood for an acoustic jam? 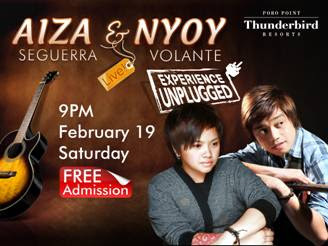 Head to Fiesta Casino Poro Point on February 19 to Experience Unplugged with two of the country’s top local musician. A popular child celebrity during the ‘90s, Aiza shifted gears and focused on her music. Since then, she has received numerous awards for her both original and revival song renditions. Her hits include “Pagdating ng Panahon” and “Open Arms” to name a few. Nyoy Volante was one of those who paved way for the comeback of acoustic music. He will serenade the crowd with his hits “Nasaan Ka?” and “Ito ang Pangako ko” among others. Be sure to save the date and have a relaxing acoustic night on February 19, Saturday, 9PM at Fiesta Casino Poro Point. Free Admission but must be at least 21 years old to enter.